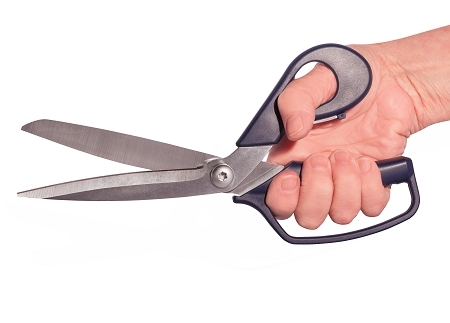 These heavy duty shears efficiently cut materials made from aramid and para-aramid fibers, such as Kevlar®, Dyneema®, Vectran®, Spectra®, Technora®, Nomex®, Innegra®, Dacron® and other materials made from fiberglass and carbon fiber which ordinary scissors cannot cut. Its blades are made of high carbon alloy steel from Japan and are infused with Molybdenum and Vanadium through a proprietary manufacturing process to harden (HRC 60-62, HCV1200) the cutting blades needed for high-tech materials. The ergonomically designed large grip-ring delivers more power with reduced fatigue and wrist strain. The grips are designed to fit in the power portion of the hand and produces cleaner cut with less effort. One blade is micro-serrated to avoid slippage and the other can be sharpened to extend life. The tang on the blades is long to provide cutting efficiency. To cut composite-grade materials is a very difficult task. These 10" shears are meant for clean long cuts into sailcloth, rope, canvas, leather, plastic, silk, cotton, nylon and other knitted fabrics. The blade angle and grinding is what sets them apart from competitors. The handles are right hand friendly and comfortable. It is an excellent shear for marine, clothing, electrical, cabling, upholstery, safety, and construction industries. Sailmakers and riggers around in the United States, Canada and Europe use these shears in their daily projects to cut fabric, thin ropes, sleeves and tapes. Fabricators who use fiberglass and carbon fiber materials have replaced their current shears in favor of these heavy duty shears. This family of shears consists of 9" (ATi-807), 10" (ATi-808) and 11" (ATi-809) shears; in sizes suitable for your application. Cut Kevlar 500 times easily. The shears still leaves a clean edge after so many cuts. The handle is large enough and comfortable. 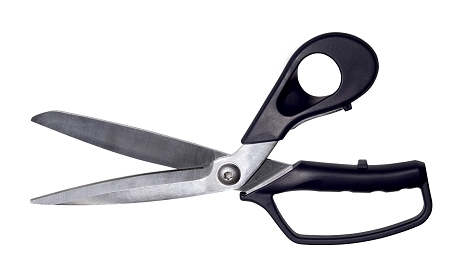 The shears provided are exactly the product required for cutting heavy technical fabrics such as kevlar, fiberglass, or carbon fiber. We are excited at how easy they are to use speeding up the production process. I used these 10" shears to cut Kevlar hundreds of times and found them to be excellent in all respects - quality of product, quality of cut, grip and handling. For the size & construction they are light. Highly recommended for Kevlar and composite work.